No matter who you are, it’s important to be prepared for disasters. The likelihood of survival (and being comfortable while surviving) is much higher when you plan and prepare ahead of time. Some individuals, including many elderly, are more vulnerable than others and need to stock up on extra supplies and should take extra time to create an emergency plan with a personal support network. We understand that life gets busy however, and it’s easy to forget to make a plan, so we’ve come up with some essential emergency preparedness tips for seniors to help you get started. Identify Your Greatest Risks – If you live in Kansas, there’s probably not much need to prepare for a hurricane. The key to efficiently preparing for an emergency is identifying the risks that are greatest in your region. The northeast United States is typically the most in danger from severe winter storms. The south and southeast are most susceptible to hurricanes, the West coast is most likely to experience earthquakes, and the Midwest is known as “Tornado Alley” for a good reason. No matter where you live, there is also always the potential for fires and a blackout. Create a Support Network – While many seniors are in good health, there are others who have limitations. Whether you have hearing or visions problems, use a cane or a wheelchair or you have other disabilities, it’s vital you not be caught unprepared. Emergencies can strike without warning, so it’s important you have a network who can help and check up on you. Meet with friends, family and caregivers to discuss your limitations, exchange house keys and important information and make arrangements for who will check up on you, how and when. Make everyone know your plan and can use any lifesaving equipment or administer any medicine you may need, in case you can’t do it yourself. It can also be a good idea to choose at least one out-of-town contact, in case everyone in your area is affected or you can’t make local calls. 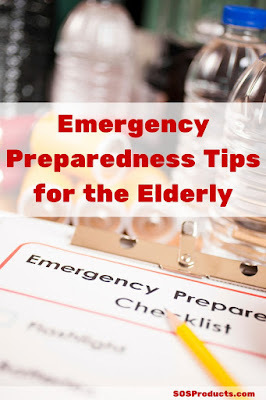 Prepare an Emergency Kit – An emergency kit for seniors should not only include the basics like food, water and first aid supplies, but it should also be stocked up with any and all prescriptions, over-the-counter medication and equipment you may need. During an emergency, you may not be able to travel to the store or pharmacy, so it’s important you already have enough of everything you could need. You also will likely be unable to reach your doctor, so talk to them ahead of time about any concerns you have and what else you can do to prepare. Beyond food, water and medical supplies, your emergency kit should also include a flashlight and extra batteries, pet supplies if you have a pet, and a solar or battery powered radio that you can use if the power is out. Familiarize yourself with your emergency kit and supplies before a disaster strikes, so if you need to find and use something quickly you already know how to do so. Did we miss any essential emergency preparedness tips for seniors? Let us know how you can up with you plan in the comments below!